Roast chicken is one of the most fun dishes to enjoy with wine—it pairs with almost anything. The only rule (in my book) is to drink something that’s got some complexity—the chicken really lets the wine shine. At under $17 a bottle, complexity can be hard to come by, but here are five wines that get it done. 2012 Delaye Saint-Véran Les Pierres Grises White Burgundy which is almost always made with Chardonnay, is a great wine for roast chicken but rarely is it cheap. This one comes from Saint-Véran in southern Burgundy, which is the source of good value wines; this one delivers both nice fruit and some minerality. Want a luxurious evening at home? Roast one of the $20 farmers’ market chickens and pop a bottle of rosé Champagne. Can’t spare the $60 for the real stuff? Try this rich and fruity pink American sparkler from New Mexico (of all places). 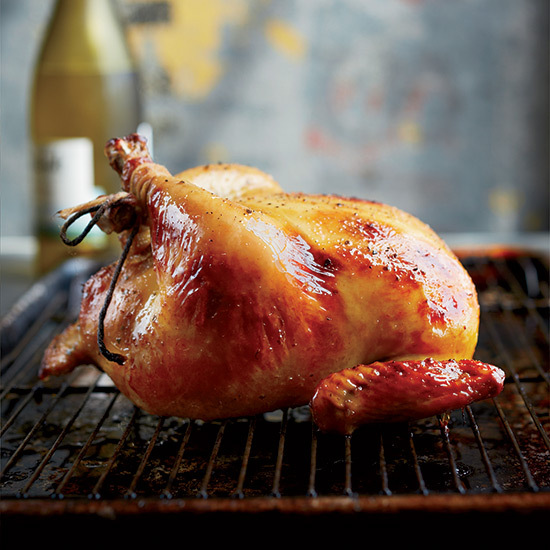 Orange wines, which are white wines left on their skins for several days, are practically made for roast chicken. They offer the acidity and lightness of whites with some of tannins of reds, along with intriguing nutty flavors. The problem? It’s nearly impossible to find cheap orange wines; but this one, from Italy’s Piedmont, is a great one to try. This wine from Lombardy in north-central Italy is made from Nebbiolo, the same variety used to make the world-renowned Barolo and Barbaresco from Piedmont, Lombardy’s neighbor to the west. Nebbiolos are known for their beguiling floral, sometimes spicy perfume. This one has that, along with lovely cherry fruit and a great price. Lots of Spanish Grenache-based wines are either cheap and cheerful or over-the-top and expensive. This one, from near Madrid, is both inexpensive and interesting. If you like your roast chicken with fuller reds, try this wine. It’s aromatic and spicy with lots of red fruit.